Fortnite’s long-awaited gifting system could be close to release. 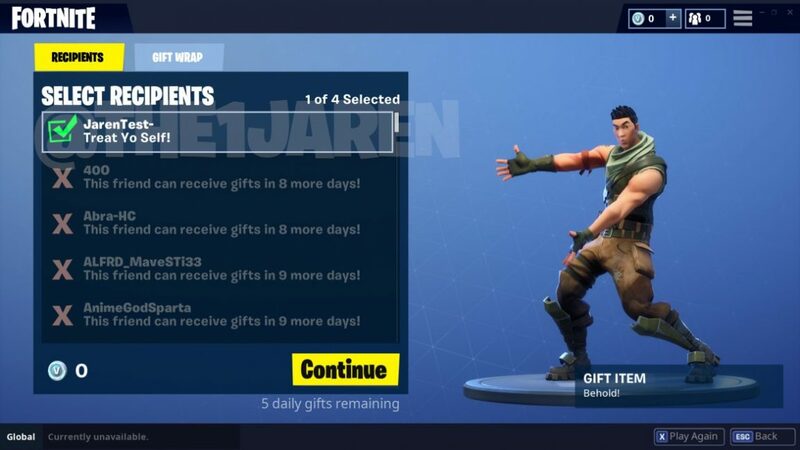 A gifting system would allow players to buy each other items from the in-game store, presumably skins and emotes, although gifting a Battle Pass might not be out of the question. V-bucks too? Maybe. The emote and action can be seen in the clip below from The1Jaren. In-game text suggests that you can gift up to 5 items a day, and there’s a countdown suggesting that gifting may be released publicly in less than a week. Epic has raised the idea of gifting before, and also plans for players to merge multiple accounts on one console for anyone that has V-bucks spread out across different accounts.